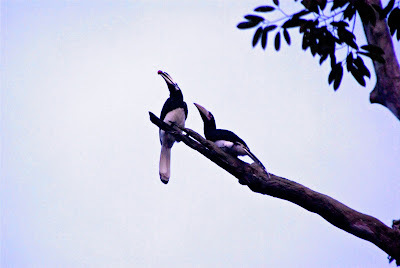 Two Oriental Pied Hornbills keep a watchful eye on the River. Yesterday I was reminded that we are in an equatorial rain forest; the air didn’t move all day, probably because it is so thick with moisture that it pulls down any breeze that tries to blow. The temp rose above 90 degrees F and became stifling. Because we are mostly traveling through dense undergrowth and because Malaysia is a Muslim country, we are covered from neck to toe with clothing. At home we remove clothes when it gets hot; here, we keep it all covered up! ~Before arriving in Borneo I thought that the heat and humidity would be miserable but it has been quite bearable. I have been drinking buckets of water and my body is adjusting quickly. Breakfast was sugar donuts and fig filled donuts, both fried in palm oil…saturated with yumminess and unhealthiness. Washed it down with sweet tea; I would give a pocket full of Ringgits (money) for a thick black pot of coffee at this point. The moon shines brightly on our night excursion up the Kinabatangan River. After dinner we went upriver in the dark to spotlight for critters. I had a few firsts: crocodile (a little one), owls, mangrove snake (apparently very poisonous), Civet (a mink like looking thing) and we saw several Kingfisher and Red Leaf Monkeys. Thirty seconds before we landed at the Jetty, the skies opened up and reminded us that we were in the RAINforest, unleashing a torrent of water on our heads! My journaling spot on Samsudin's deck. ~There is a red dragonfly who has found a roost on an extension cord strung between the trees right off the end of Samsudin’s deck. For two days he has been there, looking out over the river, mirroring what I do for a few hours each day (sit on the deck and gaze at the river). I wonder what he is thinking about and if he had a journal would he write in it as well? Most likely he is just sitting and waiting for a lady friend. Or possibly he is sitting thinking of his wife and wondering what she is doing. I took a bike to the “internet center” in Sukau to send out a “hello” and “I’m fine, hope al is well at home” email, but there was a power outage in town. So, I just have to sit here, much like the dragonfly and imagine that everything is ok.
~I haven’t hit the point where I ache to see the family, I imagine it will come in just a few days. I miss them dearly and I don’t look forward to the time when the aching starts. It always does on these trips and it is a sure sign that I need to be home. ~I spent the morning touring Sukau’s Primary School. It is a bit run down but they make it happen nonetheless. Some classes have 52 children, I don’t envy that! I took plenty of pictures to share with Rigley so she could see kids her age in a different country. Malaysia is a Muslim country as can bee seen by the children's clothing. Children learn to use computers in the only computer lab in the area. Primary school protected by barbed wire and natural beauty. Kindergartners learn English on the floor. After the school tour we went with the Hutan Elephant Conservation Unit south of town to shoot a carbide cannon. The cannon is used to scare off elephants so they don’t’ destroy a farmers crops or a plantations palm trees. This panoramic shows an area that has been clear cut to plant oil palms. This plantation stretches well beyond the horizon.